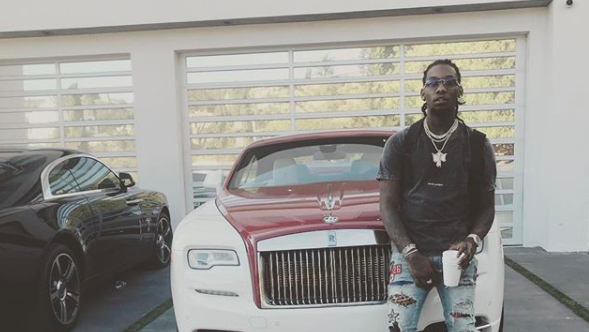 Offset is having quite the unforgettable birthday weekend. From celebrating during a star-studded black tie affair dubbed the "Set Gala" to receiving a Rolls Royce Wraith from his fiancée Cardi B to performing alongside his group Migos at Rolling Loud SoCal this weekend, the rapper has had no shortage of blessings coming in for his birthday this year. In addition to the aforementioned epicness, the 26-year-old also received quite the unique and lavish gift, with Quality Control's Pierre "Pee" Thomas presenting him with a custom chain based on the legendary professional wrestler Ric Flair. To make the present that much more special, the real Ric Flair even offered his approval of the reported $70,000 chain, reposting a photo of the new piece on Instagram and thanking the rapper for showing him love, both with the chain and in his recent track, "Ric Flair Drip." "Thank You For All The Respect @offsetyrn," the now-retired wrestler posted. "You Are Stylin' And Profilin' Sir! WOOOOO! Ric Flair Drip!" Take a look at some details of the new chain in the posts below. Also be sure to check out Offset's recent interview with REVOLT TV here and see an exclusive clip from Offset's birthday bash, above.